CPK Big Island Field Trip Fundraiser, November 15th! Please join us at California Pizza Kitchen, Ala Moana Location, on Tuesday, November 15th. 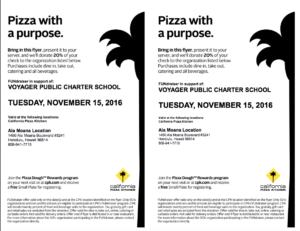 CPK will donate 20% of the earnings for all purchases made with this flyer and mentioning Voyager PCS. We appreciate your support!